If public schools are to ever become the Great Equalizer they were destined to be, it is the duty of every public school teacher, administrator, employee, Board of Education member and supporter to recognize how the institution of public education was used to create and maintain racist and classist divisions. Teachers, administrators, employees, and Board of Education members must pledge to eradicate racism from the institution of public education. This acknowledgement and acceptance of our faults must first come so that we may join together to address these wrongs and work towards removing the parts of our system that are still in place that serve to marginalize and disenfranchise too many of our students. 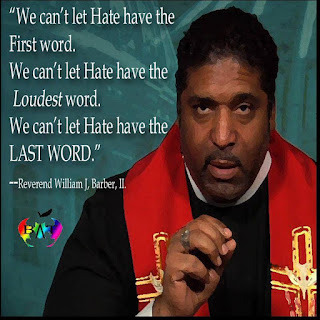 People from all walks of life must come together so that we might do this necessary work in a meaningful and authentic way in an effort to dismantle a system that is embedded with racism and in its place build something beautiful for all people. Teachers, students, parents, community members, administrators, and school board members will need to take part in some very uncomfortable conversations to analyze all aspects of Public Education with special attention to policies and practices that disproportionately affect students of color and those living in poverty. We need to be mindful of the danger of placing the blame and finger-pointing towards just one part of the system. If the whole system is not addressed, we will not be able to create the deep systemic change that is needed to really improve our schools to educate the children in front of us as well as the generations that follow. We need a system of Public Education that acknowledges the inherent worth and potential of every child and strives to support them as they pursue their passions and develop their strengths. Currently, our system of Public Education does not provide all children with this opportunity. Children fortunate to be born to parents of the right skin color who live in the best zip codes often attend public schools that have more resources, the most experienced teachers, and state of the art facilities, while children born to low-income families of color attend public schools that prepare them to assume their place in society as inferior and undeserving of rich experiences. The fact that some children fall from their pre-determined spot on top the ladder of success and others climb up from the low rungs of the fated lower class, does not negate the existence of this system. If we truly believe in the power of Public Education then we must accept this failure as our responsibility to fix. 7 million reach on Facebook! BATS PRESENT VIA WEBINAR ABOUT PRIVATIZATION TO TEXAS CHRISTIAN UNIVERSITY EDUCATION STUDENTS. BATs purchase ad on Seattle Metro Bus line telling parents to opt children out of testing. OHIO BAT BRIANNE KRAMER TESTIFIES IN FRONT OF OHIO LEGISLATURE ABOUT VIRTUAL CHARTER SCHOOLS. BATs Award their 2nd annual scholarship to education activists Tanaisa Brown (Newark Student Union) and Nidalis Burgos (Chicago Student Activist). their families, and our communities! 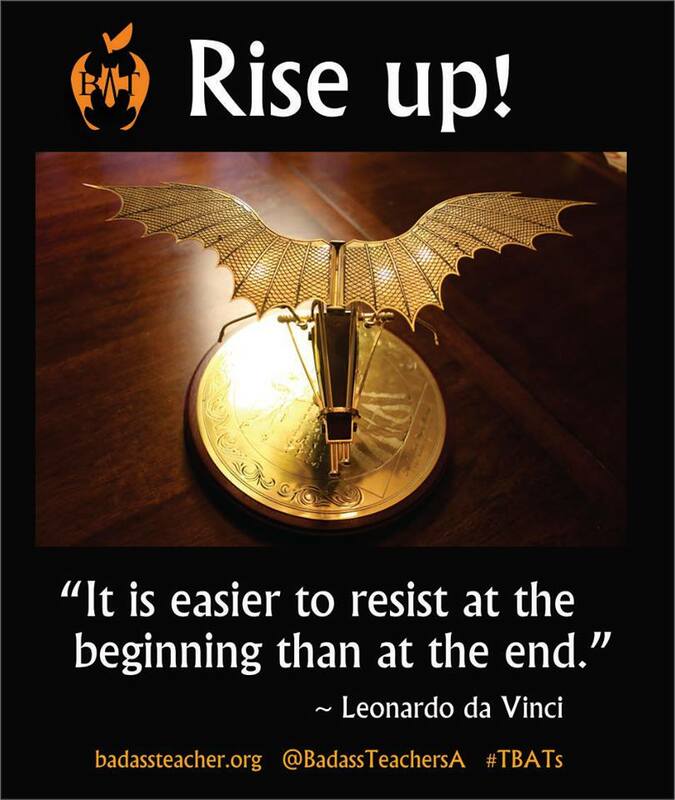 BATs Speaking up and Speaking Out all Over the Nation! A version was also run in the city's newspaper as its lead letter on October 31. When a conservative leaning and a progressive leaning media outlet both think that the issue will interest their readers, why won't the school district rethink what they are doing? Debbie Braithwaite Anderson - Attended the SOS conference, ESSA trainings & presentations, legislative hearings on education, BOE meeting testimonies, NEA & HSTA Conventions, etc. and appreciate our UCORE national conversations to encourage and support current actions! Amy Bahaynah- Together with retired teachers, concerned parents and community members, started a public education advocacy group. We have interviewed candidates for school board and local/state legislative positions. We hosted showings of Education, Inc around the city and are looking to engage more members in the coming year. Janine Schuster Kristen, Konrad Mendoza, Marsha Phillips ...and so many others in Buffalo, NY! Buffalo schoolteachers, in particular, have the bat courage to speak up on important issues at every board meeting. Kristen Konrad Mendoza and Marsha Phillips are champions for early childhood education and don't let our board get away with foolishness! Developmentally appropriate practices are repeated by these super lady bats at the dais at bimonthly BOE meetings to combat standardized and/or excessive testing; school receivership; student health and welfare (hunger, lead poisoning, physical education); returning play and exploration back to PK and Kdg. ; you name it--they are there to talk it up! Most of all, they get others to get off their badasses to spread the word, get involved and CARE--before it's too late. This includes members of our Buffalo Teachers Federation who are not aware of the issues at hand. John McTigue- I have participated in many & helped organize some raliies for public education in Buffalo. In my home district of Amherst, NY, I have spoken at BoE meetings questioning their flawed policy approach & unsuccessfully ran for a seat in that Board. I have directly confronted Erie County Executive Mark Poloncarz & Senator Schumer literally on the streets of Buffalo calling them out for their collabation with those who I perceive to be enemies of public education. (Poloncarz actually listened and engaged in discourse. Schumer was an apologist & a putz.) 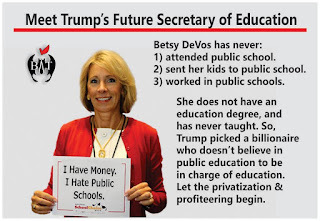 In my own unions (Buffalo Teachers Federation, NYSUT & AFT), I have been constructively critical as well as unflatteringly critical of their complicity with bad, anti-student & anti-public education stances. Drs. James Avington Miller, Mark Garrison & Reed Taylor have spoken in my class in defense of public education &/or civil rights. Mrs. Irene Taylor McVay- a litigant in Brown v. BoE (and dear friend & former colleague) has also met with my students. Many of those students have participated in &/or simply attended public forums & protests for public education. I am currently working with my former Professor Dr. Georg Iggers (refugee from the Holocaust, renowned historian & lifelong advocate for human & civil rights) on a project analyzing the historical narrative of African Americans in our history textbooks. That project has morphed into the early stages of another campaign to defend our schools. I am a self-proclaimed Facebook loudmouth. I am a proud member of BATs. My classmates in the Educational Leadership Program at Buffalo State College have informally dubbed me as a "curmudgeon with a big heart" because of my unrelenting questioning of everything from faux ed reform to Marzano to the trajectory of teaching at Buffalo State to our Dean herself. I've traveled to Albany & Washington DC to rally in defense of our schools. Pardon my boasting, but my proudest accomplishment has been to successfully challenge my students to take up the mantle of protecting our schools. Although the majority have not, those precious few who have responded favorably inspire a great sense of confidence in the future of our collective struggle. Honestly, after Trump's election I seriously contemplated quitting everything altogether. I felt defeated. My heart ached for my students. After a respite and reflection, I decided that we - the advocates for public education & democracy itself - are not defeated & our efforts have not been futile. I also admitted to myself that our plight has suffered a considerable setback. I have now concluded that our efforts have actually been a sort of boot camp for what is to come and the lessons learned along the way will prove invaluable. I know many of us have already rolled up our sleeves and fought a good but exhausting fight. Now we must lower our shoulder and go forward. I'm tired but I'm still fighting. 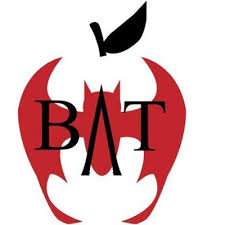 Bettie Gaylor Saccardo - A group of Texas BATS is holding meetings with parents, teachers and any interested party to get a plan of action to fight the voucher issue and a transgendered bathroom issue in our upcoming legislature. I'm proud of our Texas BATS. Jesse Curtis Twice - Called a board member. Went to capital and argued in the reps office. 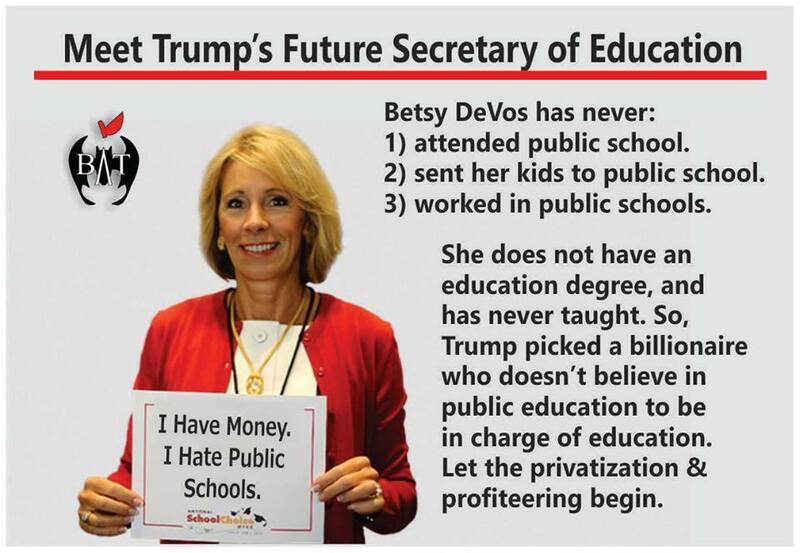 Alicia Woody Evans - I've spoken at multiple hearings at NMPED and spoke against Standardized testing, Right to Work (for less), and the putative evaluation system. I've spoken at school board meetings speaking against combining high schools. Tracy Leigh - Yes! More times than I can count at school board meetings to advocate for students, parents and educators!!! Cheryl Brisendine-Pavkovich - Have spoken many times at school board meetings. Kathleen Hagans Jeskey - Working with Oregon Save Our Schools to fight standardized testing in our state ESSA plan. Served for OEA on the state workgroup all year to help implement a house bill aimed at improving programs for English Learners in Oregon. Oregon had at least 13 BATs representing at the March for Public Ed. this past summer! Oregon BAT Tom Kane ran for Oregon legislature. Tom also helped pass an NBI requiring that OEA make available for up to four teachers to attend state board meetings. This too. http://pamplinmedia.com/.../336212-216209-canby-citizens... Canby citizens speak out on their concerns. Canby citizens speak out on their concerns, Local News, Canby local News, Breaking News alerts for Canby city. 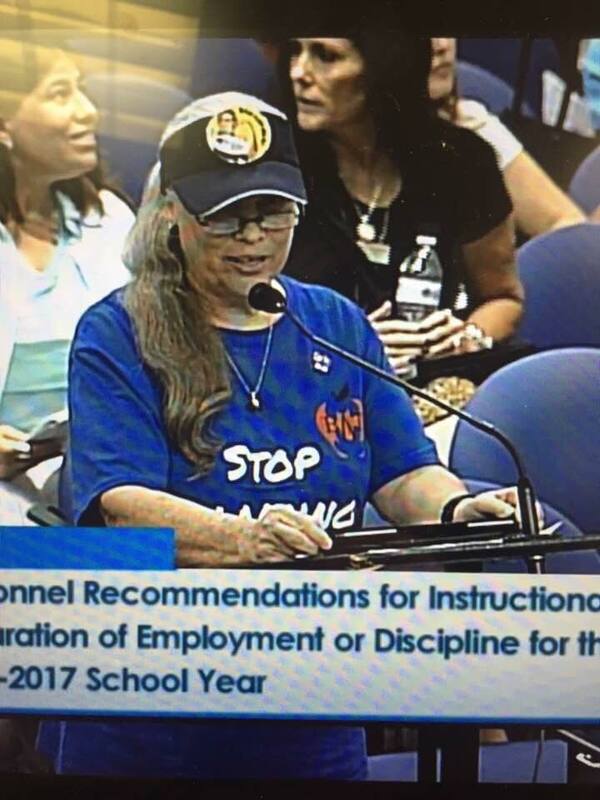 Ann MacAbee - I've spoken at plenty of BOE meetings but they won't listen to teachers, citizens, or especially me. Front page of the newspaper gets their attention. Calls/letters from NYSED gets action. Calls from lawyers get immediate action. Kristen Brodie - I got a 25 minute audience with the Texas Education Commissioner and discussed several concerns. Brianne Kramer - Testified in favor of Ohio Senate Bill 298 during a Senate Finance Committee hearing in May. Tory Wright Vine I am not a teacher just married to one- I ran and I was attacked and lost I relish my chance to be on the other side - I love my role BATS gives me a lot of info- my BOE is stuck in the dark ages thanks Marla Kilfoyle for giving me hope. Susan Loftus - Testified at BOE meeting regarding ES physical education, art, and music. Hosted showing of "Defies Measurement." Attended SOS rally and conference. Jose Maria Herrera - Played a role in the Texas textbook controversy this year. Christine Kuebler - I have spoken out at a school board meeting and shared my story, among others of what it's like raising kids after 12 years on a terrible salary. We filled the room that night. It was powerful and people had some pretty terrible things to share. We did get a 10% increase the next year. Amy Wolpin - I spent a day with other Western Massachusetts activists lobbying our state legislators in Boston on social justice, public education, prison reform, and climate change issues. Many BATs including myself campaigned across Massachusetts with our union MTA against the state ballot question 2 that would raise the cap on charter schools and we defeated the initiative!!! In addition, I was elected as a delegate from my ward's Democratic Committee and I use every meeting to talk up support for public education. Shannon McCormack - I spoke at a school board meeting against our new Salary schedule because it was not giving teachers credit for months or years of work they had done. If we had stayed on our old schedule we would have been more fairly compensated. Tina Andres -Canvassed neighborhoods in my city along with my local to elect two new school board members and deny another privatizer a seat. Watched and supported Jose F. Moreno as he took on big money to win a City Council seat in Anaheim, CA. Started a new Charter School Task Force for my local. Added my name to a complaint against Magnolia Charter Schools (Gulen) in CA. We are working hard for public education in California! Nancy Roberts Ocampo - I ran and served on my local school council. Carol Borg - I have spoken at a school board meeting. After my comments, no response from other teachers at meeting - just crickets! Don't know if they are just clueless or scared to "speak" publicly. Amy-Nicole Heintz-Roat - I have spoken at our school board (an appointed entity called the School Reform Commission), I have spoken on panels about harmful standardized testing and the right to opt out. I have gone on the record with reporters about terrible working/learning conditions in our schools. 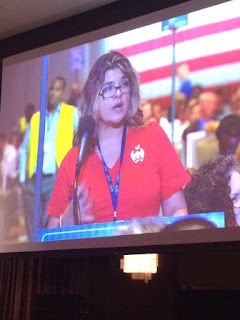 I have run for office in my union. I have spoken to undergrad ed majors and graduate pre-service teachers about the importance of advocating for social justice in and outside of schools. I have had letters to the editor published, have spoken on the radio and on television. Yes, I am a full time teacher and mother. If it is not me, then who? If it is not you, then who will it be? Donna Yates Mace - FL BATs have actively supported opt out parents in several districts. 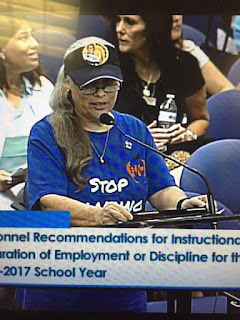 Trudy Jermanovich They, along with many BATs around the nation, continue to support the 3rd grade parents lawsuit against the state financially. FL BATs have spoken with state legislators and run for school board positions or worked on campaigns this legislative session. Kim Cook - Susan Bowles and I testified in the Citizens for Strong Schools vs. FL DOE and legislature lawsuit. Trudy Jermanovich - I've enjoyed speaking at almost every school board meeting and many of the "Workshops" for over two years. Luckily, I had many other great teachers (I'm retired) also speak out forcefully. Anna Marie Pierpont, Terry Preuss, Anna Fusco (now working within our union). We actually changed many minds on the board with regards to high stakes testing, VAM, and we're working on scaling back Marzano in the evaluation process. One of our greatest successes was getting the board to stop participating in a lawsuit which was brought because they held back students from matriculating to Fourth Grade because they had refused our state test in Third Grade (Opted Out.) Most recently we got the board to finally hold the time for public speakers at 5pm so that teachers could speak out. For years the time for public speakers was held at Noon when no teachers and many parents were unavailable.